90 days. Daucus carota. Open Pollinated. 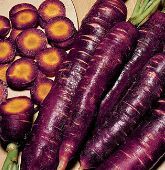 Plant produces very flavorful 6 to 9" long reddish-purple skinned carrots with bright orange and yellowish-orange core. 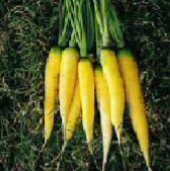 Great fresh or used for making carrot juice. It has a slightly spicy and sweet flavor. 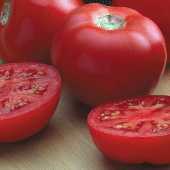 The lycopene content is equal to tomatoes! Add color to your favorite dish by growing the red, white, and yellow carrots. Does well in heavy soils. Excellent choice for home gardens. Developed by Dr John Navazio. Carrots prefer cool, wet weather to grow in. Plant seeds directly in the garden where soil is finely tilled. Wet the soil before planting. Planting should take place 25 days before last frost, or in late summer and autumn for winter and spring crops. You can have several succession plantings up until midsummer when it is too hot for growing carrots. Plants grow 12" tall. Requires loose fertile sandy soil in a well drained location in the garden. Apply much and grass clippings, or straw around base of plant. Keep soil moist to ensure germination. Water well during dry and hot spells. 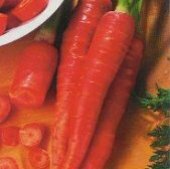 Pull carrots when they are mature and full color. You can leave carrots in ground over winter by cutting off the green tops and covering with mulch.